Yesterday was the fourth anniversary of our wedding! We celebrated at the Capital Grill in Buckhead. We did pretty well, not overeating too badly, although we certainly did enjoy our evening. A couple behind us was celebrating their 10th, and then at the table in front of us, we witnessed a marriage proposal. Fortunately for the guy, she said yes! Both families were present, but most, perhaps all of them did not know the future groom's plan for the evening. Back to running. With the benefit of a little restraint last night, I was definitely ready to run this morning. I had finished a slow 3.5 mile training run on Tuesday evening in 85 deg warmth, but the weather cooled off later in the week, and this morning it was below 50 deg when we began our run shortly after 8 am. This might be the last week that we will have a cool morning, and it was a great change from the Tuesday evening run. 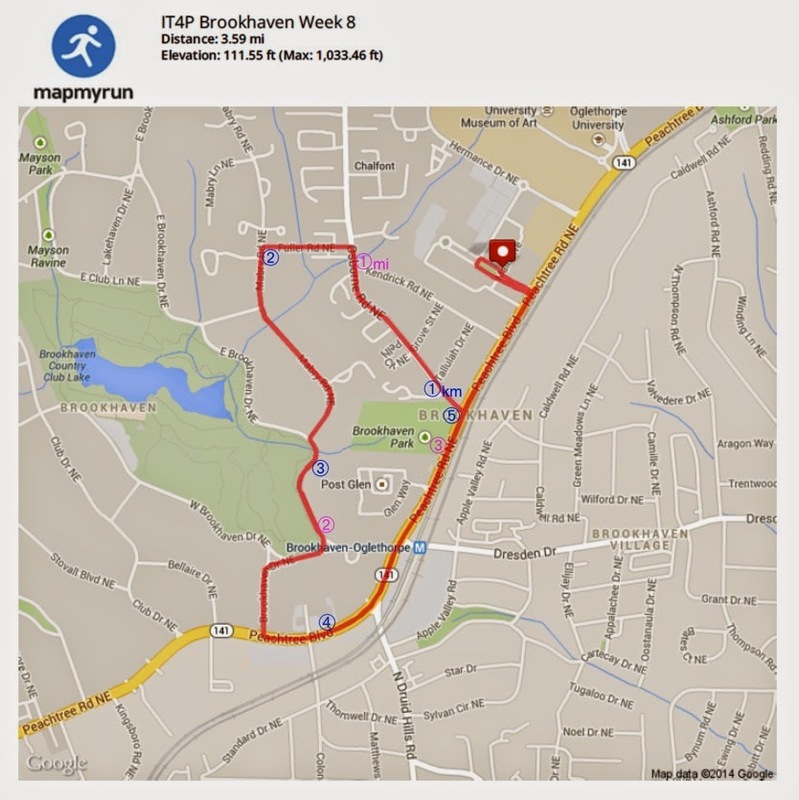 This week Curt planned our route to explore the Brookhaven neighborhood, a pleasant change from simply running up and down Peachtree. Rob proposed a pace where we would speed up a bit from the first to the second to the third mile. However, I was pretty sure that we would be encountering some hills on today's run, so I wasn't sure how that would work out. We were now running past the golf course of the Brookhaven Country Club, admiring the beautifully manicured grass when we could peek through the shrubs guarding the course from the middle class. As we reached the two mile mark, the road curved left toward Peachtree Road. But Curt had warned us that we would be going the other way! I probably would have missed that if Rob had not moved ahead to coax us to the right, away from the short cut. For some reason the name Rosie Ruiz came to mind! The road was very nicely shaded, but also uphill. I was starting to notice some fatigue and was careful not to push too hard, but with some attention to technique I made it to the top at a decent pace. Now we could make a left turn, crest the hill, and see Peachtree Road ahead. In the final stretch of Brookhaven Drive, Rob mentioned that the houses in this neighborhood are in the single figures (millions, of course), and I gasped said "If only money was no object!" I could not remember if it would be level or downhill once we got onto Peachtree Road, although we had run that section in our very first week of training. This area of Peachtree (at the 4 km mark) has quite a few nice shops and small shopping centers, where North Druid Hills Road and Dresden Road meet Peachtree, with the MARTA station on the other side of the road. First there is a big Kroger across the street, then comes the Brookhaven Station shopping center on the left side of the street. We pass Sugar Shack (haven't been there in awhile) and Sherlock's Wine Merchant, then I start looking ahead for the Town Center Mall. We reach the three mile mark as I realize that we're in the midst of a gradual uphill stage. I had never before appreciated that this was not level. As he passed me, Rob said "This hill is deceiving." It was not level. Rob was opening an interval of 5 meters on me, then he looked back and slowed down a step to check on me. I passed him as he was looking back at the runners behind me. I picked up my feet and found a reserve of energy to gradually increase my speed. We approached the intersection with Osborne Road, where the light was red. As Rob caught up with me, I thought, at least I'll have a moment to stop while we wait for the light to turn green. I started to slow down as we reached the corner and Rob went out in front of me. Just as I was about to stop at the corner, Rob dashed out into the intersection and I realized that the walk light was on. No break! We pushed forward, passing a few other walkers and runners along the way. Then Rob said "It's downhill the rest of the way." I tried to speed up, and gradually managed to take advantage of the gentle downhill to keep up with Rob. We caught the walk signal at Kendrick Road, then I saw the signage for the Town Center Mall. At Town Blvd, we were lucky with the timing again with the walk signal, and I followed Rob into the mall. Right turn and the final 50 meters to the Publix Garage. I slowed down to make the sharp right turn into the garage, Rob ran to the entrance and held up his hand for a high-five as we finished our runs. Although the overall pace was slower than last week, we did more hill work today, which was definitely good practice for the Peachtree Road Race.